A hydroponic garden sits on the top of a parking garage. A farm covers a parking lot beside a raised highway. 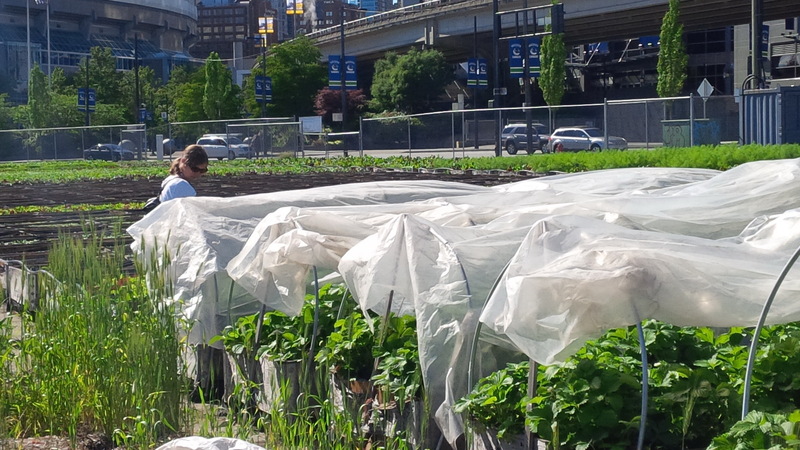 Urban Farming was one of the most interesting study tours at the Federation of Canadian Municipalities in Vancouver in June. The tour started off with a local community garden beside a school. Most of the plots were cultivated by aboriginal students at the school. Having a plot in the Sunnydale community garden, I knew about this form of urban farming. Most interesting was the comment from one of the councillors on the tour that her city’s community gardens have barbed wire on top of the fences. Hope we never go that far. Our chicken wire fences are to keep out bunnies, though not raccoons or squirrels as I have discovered. Beside the garden sat a transport truck trailer. A similar trailer sat beside the urban farm we visited. I asked what they were, thinking they might hold supplies for the gardens and farms, though pretty big. Turns out the trailers are located throughout Vancouver and hold several days worth of emergency supplies for citizens in case of earthquake. The urban farm on a parking lot is located near the Rogers Arena. The land is owned by a developer and could eventually become condos. The farm is portable, all the beds raised just above the asphalt of the parking lot. The farm workers are recovering drug addicts, the mentally ill or homeless. The produce is sold at farmers’ markets and restaurants. Solefood, the organization that runs the farm has several throughout Vancouver though this is the largest. They have also started a fruit orchard on contaminated land with the trees in containers. 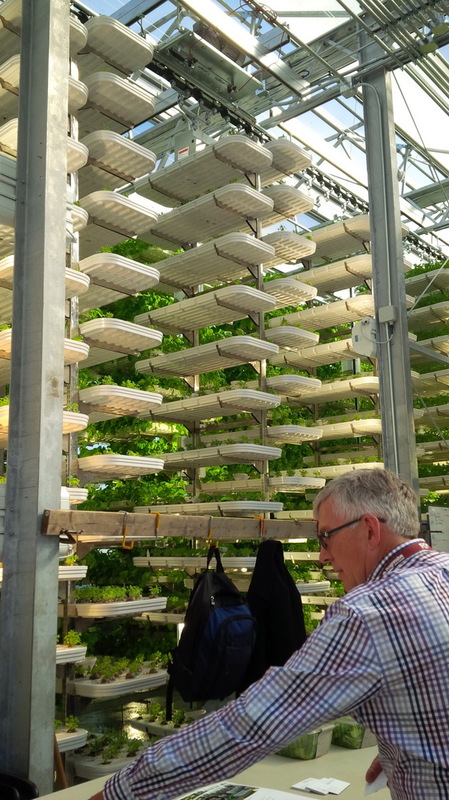 The hydroponic farm on the top of a parking garage shows what happens when a city moves away from car dominance. The farm grows hydroponic greens for local markets and restaurants. The farm is not yet quite breaking even. No, it doesn’t grow any of B.C.s other hydroponic crop. One of our group asked how they paid their rent as normally each car space in a car park is pretty profitable real estate. The owner said that in fact, parking garages in Vancouver are often half empty as people take transit and don’t use their car to get to work. It was true, as we walked back down, the car park was half empty. Our bus driver said this is because parking is so expensive in Vancouver but a glance at the Metro parking website shows parking costing about a dollar an hour, less than Toronto or even Kitchener. Another article said the maximum for on street parking is 6 dollars an hour. Toronto is around 5.50 an hour, but I have parked for less in lots. The ease of biking is also blamed for the decline in car use. There are separate lanes for bicycles as my husband found out in Stanley Park when he was yelled at for standing in a cycling lane. We found a pedestrian walk beside the sea and quickly moved there. There is also a 12 percent tax on the sale of used vehicles. The ease of using the Skytrain and transit is listed as a cause of the decline in cars. Certainly we didn’t even use a taxi in Vancouver, using transit and walking to get to our destinations. Here is an article about Vancouver’s decrease in car use. This entry was posted in Regional Councillor Jane Mitchell's Blog and tagged agriculture, community gardens, cycling, farming, Light Rapid Transit, parking, parking garages, taxes, Urban farming, Vancouver. Bookmark the permalink.